Imagine your next vacations in an island... in the middle of a big lake... in the deepest of the Amazon Forest... with total comfort. Yes, we make it possible. We can conciliate for you the opportunity of going fishing in the Amazon rivers and lakes, trekking and getting acquainted with the Jungle luxuriant flora and fauna, enjoying a bird symphony at sunset, going alligator spotting in the evening, making friends with Indian descendants in their small villages. To experience the magic and mystery of the largest tropical forest in the planet, staying in its very heart, with comfort, is a most unique experience that we can offer you. Gold was first found in Minas Gerais in 1689 and soon after the gold rush began, lasting for more than a hundred years. Much of the gold was sent to Portugal by the colonizers, but a large amount was spent on building magnificent Baroque churches, lavishly decorated by the famous sculptor "Aleijadinho" and by many other artists of that time. The masterpiece of Baroque colonial architecture in Brazil, Ouro Preto has been declared by UNESCO a cultural monument for all mankind. Its mid-18th century appearance has been faithfully maintained to his day - narrow stone-paved streets winding through the town's hills lined with centuries-old houses and baroque churches. Congonhas is the birthplace of "Aleijadinho" (literally The Little Crippled One), the most important artist in colonial Brazil. Congonhas major attraction is Aleijadinho's life-size representation of the Stations of the Cross in polychromatic woodwork, one of Brazil' greatest artistic treasures. Also by Aleijadinho are the world-famous statues of the twelve prophets in front of the Matosinhos Church. These three cities also date back to the 18th Century and grew thanks to the discovery of gold in the region, the expression of which can be seen in their rich urban and religious architecture. Sabará is famous for its Museum of Gold and for the Nossa Senhora do O" Church, which displays a peculiar oriental influence in its architecture and in the features of the statues of the saints. Tiradentes is the birthplace of Tiradentes (literally Toothpuller), the martyr of Brazilian Independence. São João D'El Rey, the former commercial axis of the area is the departure point for a charming trip to Tiradentes aboard a 19th Century steam train, the "Maria Fumaça" (Smoky Mary). Each of these cities is by itself an open air museum, a vast and significant collection of baroque art. Together they make the most unique assemblage of 18th century art, history and atmosphere in the whole world. CLASSIC DMC TRAVEL can design the most varied itineraries to Minas Gerais, each of them a unique trip to Brazil Colonial times art and atmosphere. Carnival in Rio is the greatest show in the world. 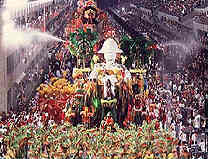 Its highlight is the "Samba Schools" Parade, a festival of light, color, music, dances and samba rhythm. The "Samba Schools" are neighborhood groups from Rio's slums and working-class suburbs. Each one is formed by as many as 5,000 people in average. The largest of them, in number of 14, perform their show on Sunday and Monday, seven of them each night. The Parade is a kind of open air opera-theater. Each "school" chooses a new theme and writes up a new song every year, a musical interpretation of what is shown in the floats, costumes and choreography. The dancers are divided into sections called "alas" that interpret the various parts of the theme. Dancers, singers and drum players dressed in the most beautiful and elaborate costumes defend their "School" with a passion just comparable to the passion of Brazilians for their football teams. Because the parade is a contest, they want their "team" to win not just because of the cash prizes awarded by the jury, that will help to support next year's parade , but mostly for the pride of being considered the best. and for the good contracts for presentation of their Art all over the world. The Carnival Parade is the opportunity for thousands of poor people to feel like queens and kings for one night. They find it worth to work all year long to enjoy those moments of glory. The parade flows before your eyes like a river: thousands of people performing a play called Brazil - its legends, its folklore, its history, its everyday life themes. They are performing for you. If you were not there to see, the show would not make sense.